When school’s out for the weekend, these 76 picture puzzles will entertain kids for hours! Double your fun with these 76 special picture puzzles! First, kids can enjoy the challenge of completing a maze. When they’re finished solving the puzzle, they can color in the correct path and see a cool image hidden inside. 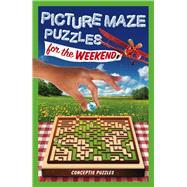 Conceptis Puzzles is the world’s leading number-logic and picture-logic puzzle supplier. Every day, more than ten million pages with Conceptis puzzles appear in 40 countries.